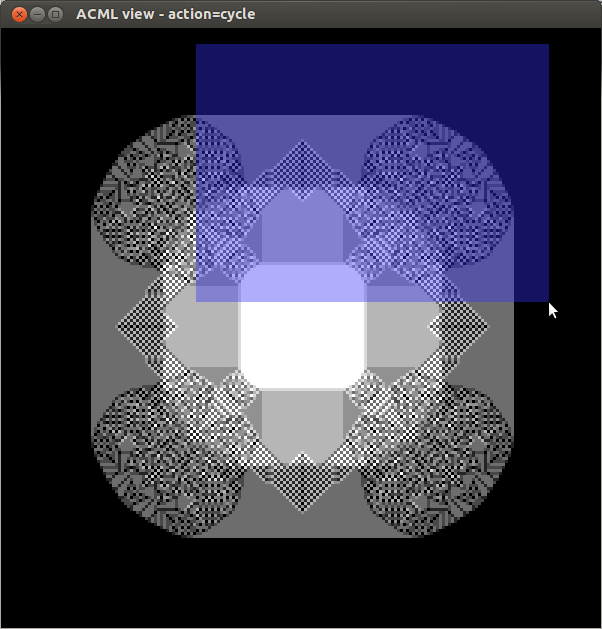 ACML is a cellular automata simulator that focuses on easy definition and exploration of arbitrary rules and initial configurations. You're attending a conference on cellular automata, the speaker presents an interesting example and you want to play with it immediately without interrupting him/her nor stealing his/her computer. Then you start to think of a possible variant of the example, then another one, and you quickly come to a whole family of rules that you want to explore quickly by adjusting some parameters. Later, you start more serious investigations and want to test some conjecture on a large family of small examples. The test involves creating particular initial configurations and running the examples until some event occur. In addition you want to save the configuration reached in each case, and of course you want to let the whole test run autonomously during the night. Finally, you're in the process of writing a scientific paper/talk and need to illustrate it your with various figures. Some are simple screenshots, others are full Tikz code to produce a space-time diagram where some states are given a name typeseted in LaTeX. Moreover, the cellular automaton you want to define is big and very structured, so the best way to describe its transition rule is by using a high-level programming language. Launching ACML without any command-line option gives you an interface with two windows: a control window with many buttons, and a view window where the simulation is displayed. Using the control window should be more or less intuitive. You can also interact with ACML through the view window (click Help button to know how). echo "Wait..." && acml --quiet --batch random_cyclic --stop 200 --shooting --shootfile tmp_ihopethisisafreshname.png && convert -delay 10 -loop 0 tmp_ihopethisisafreshname*.png surprise.gif && rm tmp_ihopethisisafreshname*.png && echo "Now open surprise.gif"
Moreover, in ACML, a family is always given by its source code. Therefore, ACML is capable of saving the current object as a new source code which is essentially the pair: family + context prior to object generation. parameters: exploring large families of cellular automata by quickly adjusting parameters instead of painfully openning them one by one. Parameters can be anything, you are free to introduce them in your source code. readability/reusability: for instance, you can write the code to define a family as "an additive cellular automata updates each cell to the sum of its neighbors modulo the number of states". It's clear, indepependant of the dimension, the number of states or the neighborhood (which are just parameters). Later you can copy/paste this code and easily add a parameter called "alpha" to define another family as "an affine cellular automata updates each cell to alpha plus the sum of its neighbors modulo the number of states". Code is often reusable. On the contrary "111→1, 110→0, 101→0, 100→1, 011→0, 010→1, 001→1, 000→0 " is both uncomprehensible and not reusable. ACML can work on the current object like any other simulator (start/stop simulation, screenshot, etc). But it also has a current family which allows you to change the current object. In this example, you can explore the family of classical cyclic cellular automata (you can get detailed information on the current family/object by clicking the info icon at the top-right corner of the control window). 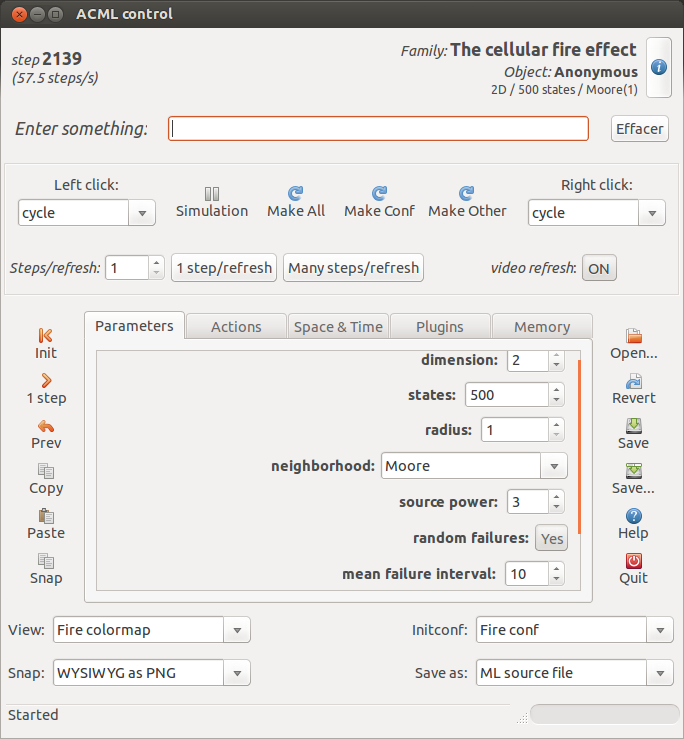 To start/stop the simulation, click on the Simulation button (upper toolbar). To generate a new CA from the family and a new configuration, adjust parameters as you want and then click on Make All (upper toolbar). To generate only a new initial configuration and keep the same automaton, click on Make Conf (upper toolbar). You can also change the configuration type (bottom right). When you obtain an interesting rule, click on Save (right toolbar) to save it (automaton with current parameters) as an ACML source file. When you see some nice configuration, click on Snap (left toolbar) to save it as an image file. acml "fun me howmany -> if (howmany 1 = 3 && me = 0) or (me = 1 && howmany 1 <= 4 && howmany 1 >= 3) then 1 else 0"
gives you a new mouse action which turns all non-zero states into 1s inside the selected zone. It is selectable from the control window, or directly by holding key "b" while selecting a zone with the mouse in the view window. reproducibility: ACML can manage random seeds for you. If you use pseudo-randomness apropriately in your source files, you can generate and simulates as many rules on as many configurations as you want and just click Save when you're happy: a new source file is saved and opening it will reproduce exactly your last experiment. the code is visible: first, ACML is open source. Second, the code of each rule, family of rules, plugin, etc is accessible from within the interface in flew clicks. We think that, frequently, exposing the code (or portion of code) is the best way to explain what exactly does some function. So let's write programs for ACML! WANRING! OcamlSDL version 0.9.0 (and maybe also some earlier versions) contains a bug in mouse click detection. OcamlSDL version 0.9.1 works. ACML should compile on any plateform where you can install these prerequisite (tested on Ubuntu Linux and Mac OSX). To install these packages, external libraries (e.g. SDL, GTK+2 and CAIRO) must be installed on your system (they are not provided by GODI). This installation method works on MacOS (tested on 10.6 and 10.4, using fink for external libraries). In case of a compilation failure, it might be necessary to do run make clean before another make. In the directory src/builtin, you can add or remove as much ACML source files as you want. Each file can contain a family of cellular automata or a plugin. During the compilation, all these families or plugins are embedded in the binary. Is there a FAQ in preparation? Yes, just ask me frequent questions.